Officially opened on Saturday, new blue Terry’s Belly was actually open to ride last week and as I luck would have it I was at Bike Park Wales on Friday. 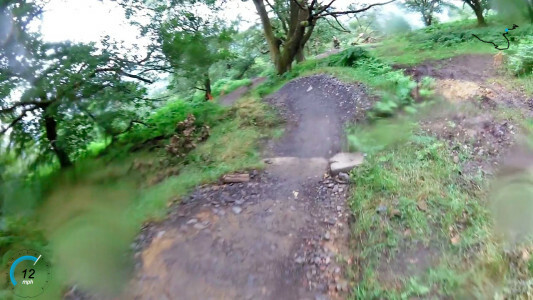 Billed as the UK’s longest blue, flowing trail, it’s about 3 miles in length, going down a largely untapped side of the hill at Bike Park Wales. As usual you start from the main uplift point, but there’s a bit of linking trailing to get you new dual entrance for 50 Shades of Black and Terry’s Belly. The official promo video (shown at the bottom) is actually very representative of what it’s like to ride. From the dual entrance, the first section that takes you down to the forest. To be honest the trail doesn’t really get going till you reach that forest – you can warm up on the first bit, but its once you’re in the trees the fun starts. Straight into a nice bermed set of corners it sets the tone for the rest of the trail. It’s a really flowing trail which you can pump and glide all the way down. Along the way are loads of little poppy jumps. These can easily be rolled, but equally just push into the jump and there’s loads of fun to be had. It’s a great way of building up actually, doing more and bigger ones each run. Even I managed a nice little sideways jump into a berm on my second run – wish I’d had time for more as my confidence was growing, despite the inclement conditions (and this was the driest run!). Even though its a long trail, it really is fun all the way down. I’m trying not to use the word “flow” too much, but that really is what its all about and all those berms make even the sharper corners ease into the next. Terry’s Belly is a great addition to the already excellent selection at Bike Park Wales. Good for all levels, especially those of us that have short attention spans and like to “play” as they ride. It’s also as good for those new to Bike Park Wales, as it’s as challenging as you want to make it – nothing is forced. (Next Post) FoD in a different time!